A foreign driver's license issued in a foreign country can not be operated in Korea. However, holders of a driver's license issued by a foreign authority may apply for an exchange with a domestic license through the following procedure. Examination of required documents such as Embassy Confirmation: In case the supplementary documents are insufficient in the examination process, the person in charge may request to submit additional documents. 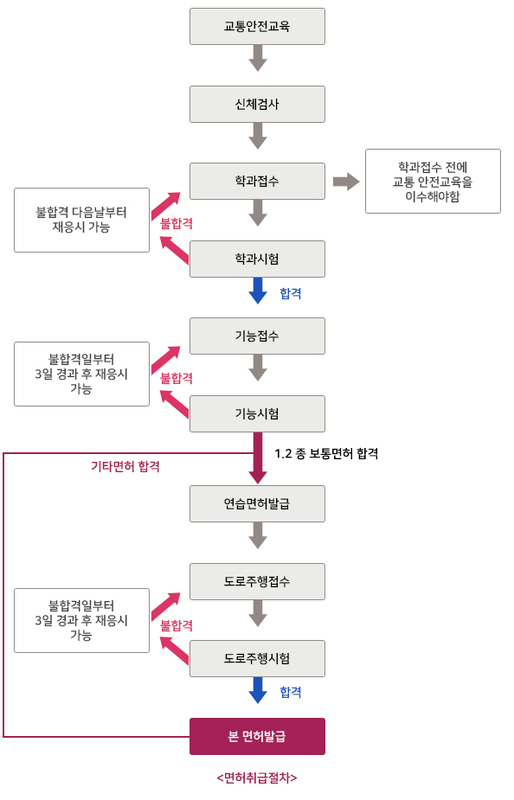 Aptitude test (physical examination) and department examination: Exemption from the examination when exchanging the license of a Korean license. ※ A foreign driver's license is valid only for a full license that has a valid period of stay. Temporary, learner, provisional, probationary, permit, or exchange can not be issued. What is a national license? - Countries that exchange Korean licenses for their own licenses without a separate test. - If the status of Korean license has been changed since the notification was issued and if it has been notified, it will be subject to the modified system. Licenses issued by Korea Licensed Authority: Only an aptitude test (physical examination) is conducted. ※ Oregon, USA and Idaho, USA Conducted examination even in a mutually recognized country. ※ If there is no separate notification about suspension of issuance of the certificate, please inquire at the Embassy of the Republic of Korea in advance to inquire whether the confirmation of the embassy of the country concerned is issued. Certificate of immigration and passport: Through the certificate of entry and departure and the entry and exit seal on the passport, the applicant has stayed in the license holder country for more than 90 days and confirmed that he or she has stayed on the issue date of the foreign license. The local is a person who has registered as a resident in accordance with Article 6 of the Resident Registration Act. • Issuance of a foreign license is limited to two domestic licenses. • A license issued by a country (Belgium, Poland, Spain, Italy) otherwise specified by the Mutual Recognition Convention may be issued for a license of a different type. • Hong Kong, Taiwan, and Guam are included in the national category. •If the Korean license has been canceled in the past, the driver must be trained for 6 hours. There are various types of driving license schools in Korea, and you can get driving education here. The driver's license school is a private institute established by an individual who is licensed by the National Police Agency. It is divided into general academies that can only provide driving education and specialized academies that can take their own tests in academies. Driving education in Korea is not possible at the driving license test center in Korea and only driver's license test is available. You can take the driver's license test immediately after completing the education at driving school, but it is only applicable to 'driving school', not general driving school. If you go to a general institute other than driving school, you must take the driver's license test at the driver's license test center. Before taking the driver 's license test, traffic safety education and physical examination are done first. A physical examination room is usually provided at the driver's license test center. The physical examination fee for the test center is 1 large / special license 6,000 won and other license 5,000 won. Fees may vary at designated hospitals. It is a multiple choice test of 40 questions about Korean traffic system and law. The exam is available in Korean, English, Chinese, Indonesian, and Russian. Countries that accept Korean driver's licenses (see table below) are exempted from the test regardless of the visa type. Countries that do not accept Korean driver's license may be excluded from the test depending on the visa type. For more information, please contact Jeonnam Driver's License Test Center or refer to their website. Students must pass the functional test within one year from the passing date of the examination. ※ After the original application is discarded around 1 year, new applications must be received from the examination. In this case, traffic safety training is not necessary. Ability to operate vehicle during parking mode: Headlight, turn signal, wiper, gear shift. Ability to operate the vehicle during driving mode: driving for 50 meters. In case normal test can not be carried out, such as by disobeying the tester's instructions and controls. If the engine fails to start after three attempts. When starting the car with parking brake still on. If you fail to pass the end point within 5 minutes after departure. If you do not wear safety belts correctly from start to finish. You must pass the functional test within one year of the written exam, For 1, 2, and usually candidates you must obtain a driving license. Level 1 , Level 2 Regular: As a candidate for the license test, a person who has passed both an aptitude test, a department test, and a function test. At the time of receipt of the driving test, the test is conducted at the licensed test site on a designated date. Road driving is divided into several courses. The test procedure and the course are randomly selected by the computer before the test. If it is deemed that the driving capability is insufficient due to "unable to start" the vehicle of more than 3 times, "engine stop due to clutch malfunction", "use of rapid braking", "rapid operation or sudden start". If the safety distance is not clear and the risk of causing a traffic accident due to the lack of driving ability such as the phenomenon of being pushed more than 1 meter backward from the ramp is significant or causes a traffic accident. If you are not able to operate normally due to the effects of drugs such as drinking, overwork, drugs, hemp, etc., or use of mobile phones, or if you fail to obey instructions and control by the examiner for traffic safety and communication. If you violate the obligation to pass from the center of the road to the right side. A violation of the obligation to follow a signal or instruction. If you have neglected the obligation to protect pedestrians. If you violate the special protection obligation of children's school buses. If the maximum speed specified by law or safety mark exceeds 10 km / h.
When the maximum speed specified in the child protection zone, the elderly and the disabled zone is exceeded. If you do not wear seat belts from departure to the end of course. If the emergency car does not pause or give way on the first pass. You must pass the road test within the validity period of the training license (one year from the issue date). If the validity period has passed, one must retake the road driving test and functional test again but exempted from the traffic safety education test. After applying for the road test, the unacceptable person (including the history of failed automobile academy) is allowed to retake after 3 days from the date of rejection. Ex) If the rejection is 1 day, it can be rescheduled from 4th. In spite of the expiration date of the international driver's license, the validity of the international driver's license may not be valid after 1 year from the entry into the country in accordance with the contents of the international agreement and relevant laws and regulations. You must have them together. If you are driving with an international driver's license in most foreign countries, you must be accompanied by an international driver's license, a Korean driver's license, and a passport so that you can be punished without your driver's license or passport. Also, the validity of an international driver's license can not be accepted if the spelling of the English name on the international driver's license does not match the spelling of the English name on the passport, or if the signature on the international driver's license does not match the signature on the passport. The international driver's license form recognized in Korea ‘International Driving Permit’ issued in Macao etc. ‘International Driving License’ can not be used. ※ If you do not have a driver's license in accordance with the Korean Road Traffic Act, it will be a violation of the law. To obtain a motorcycle driving license of less than 125cc, you must acquire a Level 2 Motorized bicycle license and a Level 2 small license to obtain a motorcycle driving license of 125cc or more. If you are 16 years of age or older, you can issue a license. If you have already obtained a driver's license certificate,Level 1 large Those who have already obtained a driver's license certificate will be exempted from the examination. - License Acquisition Process : It is not much different from the procedure for obtaining a driver's license. In the case of the department test, Motorized license costs 5,000 won and the Level 2 small licensee costs 7,500 won. For the functional test, Motorized license costs 6,000 won, and Level 2 small license costs 7500 won. If the driver gets out more than two times or touches the floor, he will be disqualified. - License test center: All small-sized, Level 2 small Motorized bicycle license tests are carried out at all driving test sites in Korea except for Taebaek, Chungju, and Masan driving license test center.